High Definition video products are emerging everywhere, from camcorders, TVs, to HD players. There is no doubt that HD is the up and coming new video standard, so how about HD editing capabilities on your PC? That is exactly what Sony is offering with their new VAIO VGC-RM1N desktop PC. 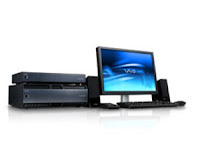 The VAIO VGC-RM1N deviates from conventional desktop designs by having two system units. The main unit has the major components like the motherboard and processor while the secondary unit has the optical drives, hard disk and multi-format card reader. Both units of the VAIO VGC-RM1N can be placed either horizontally or vertically, giving users the choice of how to set-up their desktop. The only downside is that a monitor is not included in the package. The VAIO VGC-RM1N is a truly powerful machine that houses power-packed features that is designed mainly for HD video editing capabilities. The VAIO VGC-RM1N is equipped with the latest Intel Core 2 Quad processor with 8 MB of shared L2 cache that could meet the demands of HD video editing and could keep up with the latest professional multimedia applications. The 2 GB DDR2 SDRAM memory on the VAIO VGC RM1N provides for faster processing and ensures that the system is running smoothly. Inside the secondary unit of the VAIO VGC-RM1N is a twin disk Serial ATA RAID 0 hard disk drive with 1 terabyte or 1024 GB of capacity, enough for at least 20 hours of HD editing and could be expanded to an additional 50 GB with the Blu-ray Disc optical drive.